Does the Rise of Airbnb Mean Fewer Housing Options for Marfa Residents? Home rental websites like Airbnb and VRBO have gotten hugely popular over recent years, but as the market for short-term rentals grows across the country, people are concerned about how that’s affecting long-term housing options. The research is just getting started, but the impact of short-term rentals is most pronounced in towns where housing is already scarce – places like Marfa, where renters do lots of moving. “It’s kinda known as the Marfa Shuffle,” says Julie Bernal, who’s done plenty of shuffling since moving here four years ago. Before she landed her most recent place, Bernal moved six times in three years. Housing has been tight in Marfa for a while. The growth of Airbnb and VRBO have made some people, like Bernal, feel like finding a spot is even tougher now. For some homeowners, renting short-term can be simpler. There’s less wear and tear on the house, and they can often make more money. But housing advocates worry that more short-term rentals means fewer homes for long-term residents. According to Junfeng Jiao, a professor of urban planning at the University of Texas at Austin, the impact is strongest in high-demand neighborhoods. 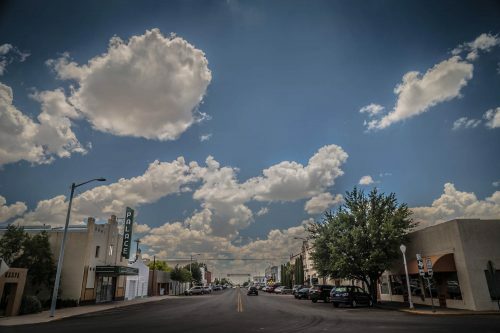 And with a population of about 2,000, Marfa could be seen as one, big, high-demand neighborhood. Emma Rodgers witnessed firsthand the decision to rent full-time through Airbnb. Last November, she found a two-bedroom house for $1,400 per month. But right as she was set to move in, her roommate backed out. In need of a quick solution to make up the other half of the unit’s rent, they decided to list the now-empty room on Airbnb. Six months later, her landlords told her they wanted to rent the whole house through Airbnb. So she had to move. That wasn’t ideal, but she says it actually worked out for the better. Rodgers says that living arrangement could be psychologically stressful. In 2011, Marfa averaged three listings on Airbnb, according to the company’s own data. In 2015 there were 47, a big jump for a small town. Cities across the country are trying to figure what to do. In February, for example, the Austin city council voted to limit short-term rentals to thirty days a year, and in 2022, some short-term rentals in Austin will be banned completely. That’s not a fix Marfa Mayor Dan Dunlap would push for. Mayor Dunlap knows housing’s important, but he’d rather encourage developers to build more affordable housing instead. He acknowledges it’s not that easy. Currently, there isn’t a proven model for how towns and cities should deal with the rise of short-term rentals. That’s partially due to the fact that there’s not really much research on the issue yet. More than that, we can’t definitively say that short-term rentals are causing a housing shortage. Dr. Jiao says they “could” contribute to a decline in availability of long-term housing, but that there are too many other variables to say for certain. But in places like Marfa, he says they’re definitely a factor. It’s a complicated issue. Even for Julie Bernal, the renter who had to move six times when she first got here. Today, she owns her own house, and to make a little extra cash, she rents it on Airbnb. She says the extra income has been really nice. For people in Marfa, a chance for any extra income can be hard to turn down. – Rachael Vasquez and Travis Lux. This entry was posted in KRTS News and tagged airbnb, Housing, long-term rentals, marfa, sharing economy, short-term rentals, vrbo. Bookmark the permalink.